Yes, you read that right. Vodka. But don’t worry, this won’t get Aunt Millie drunk (you’ll need something else for that), she’ll never even know it’s there. 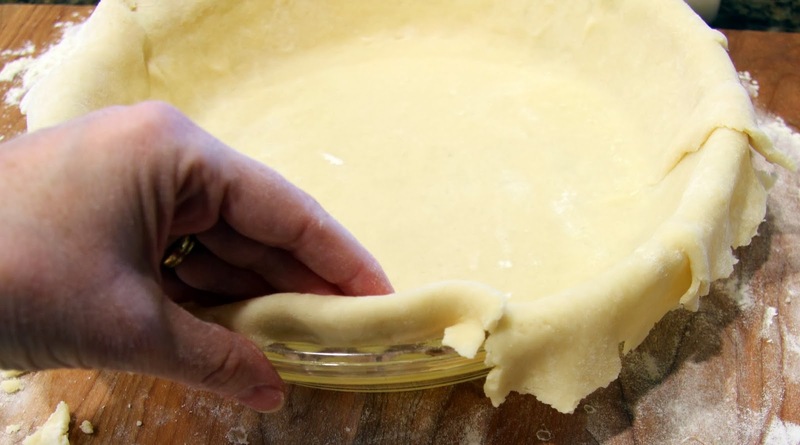 What it will do is give you a beautiful, flaky crust for your favorite pie and make you a hero to your friends and family. The folks at Cook’s Illustrated figured out this genius new ingredient a few years ago. The alcohol vaporizes in the oven, allowing you to use more liquid which makes it easier to roll out the crust without overworking it. It’s a beautiful thing. Before you begin, it is of utmost importance that all of your ingredients are as cold as possible. I stick my butter, coconut oil and (sometimes) flour in the freezer for half an hour before making my crusts. The colder the ingredients, the flakier the crust. Don’t be intimated by the length of this post and the number of steps. I just wanted to make sure that, if you want to make your own crust, you have all the necessary information. There is an art to it, in my opinion, but it is very simple if you know what to do. 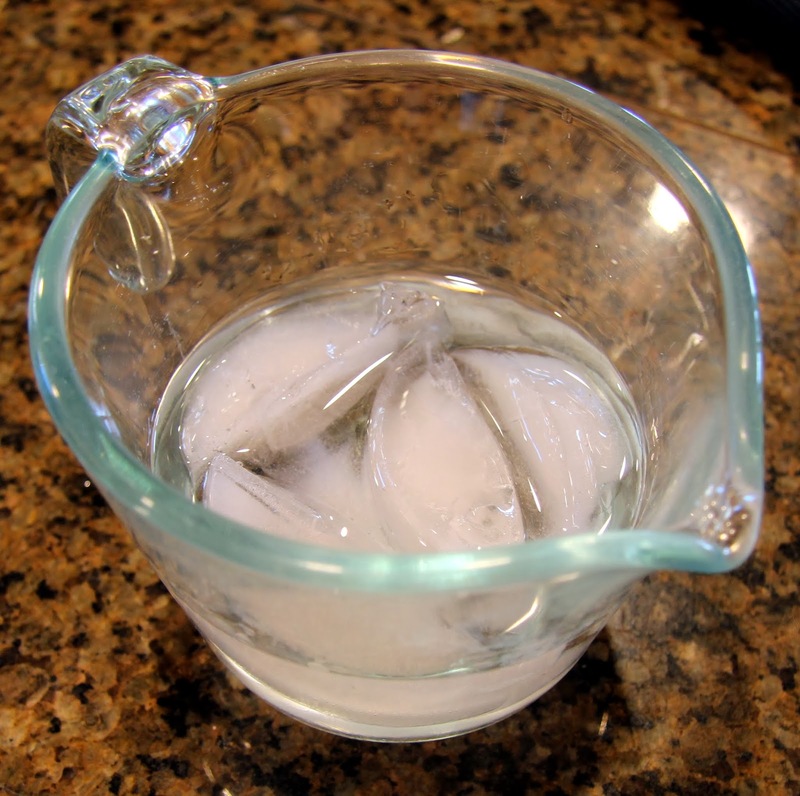 Pour vodka and water over ice to chill. Set aside. 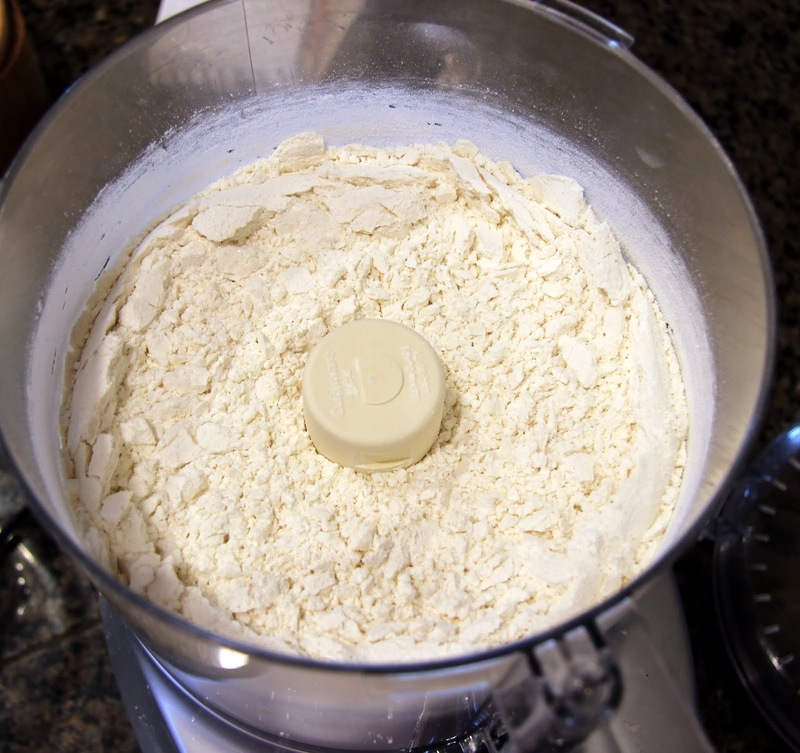 In a food processor or large mixing bowl, mix together 2 cups flour, sugar, and salt until well combined. 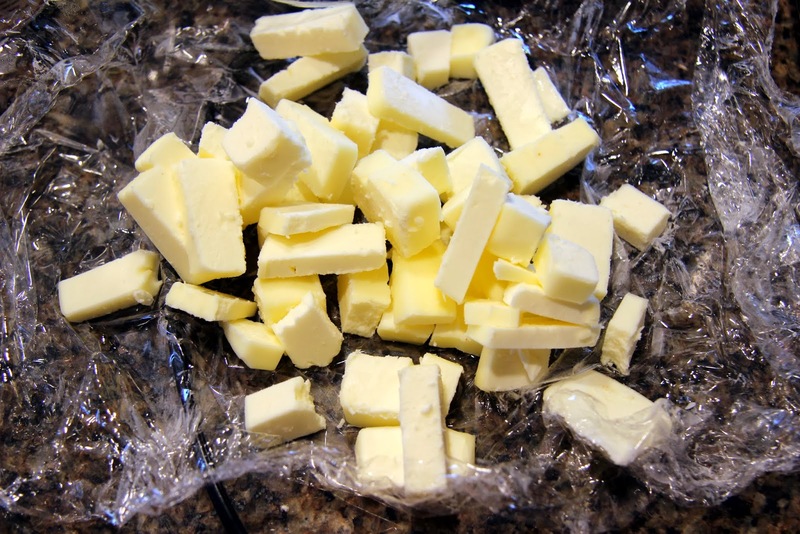 Cut 3/4 cup cold butter into small chunks. 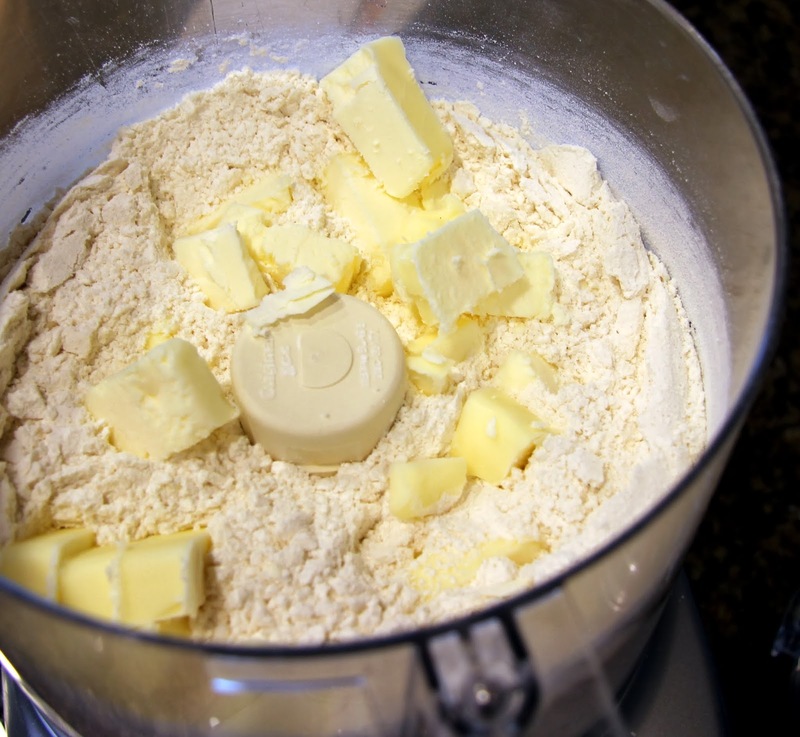 Using the food processor (on pulse), pastry cutter or your fingertips (coolest part of your hands), incorporate butter into flour mixture until it is almost fully combined. You should be able to press it into a form as shown below. 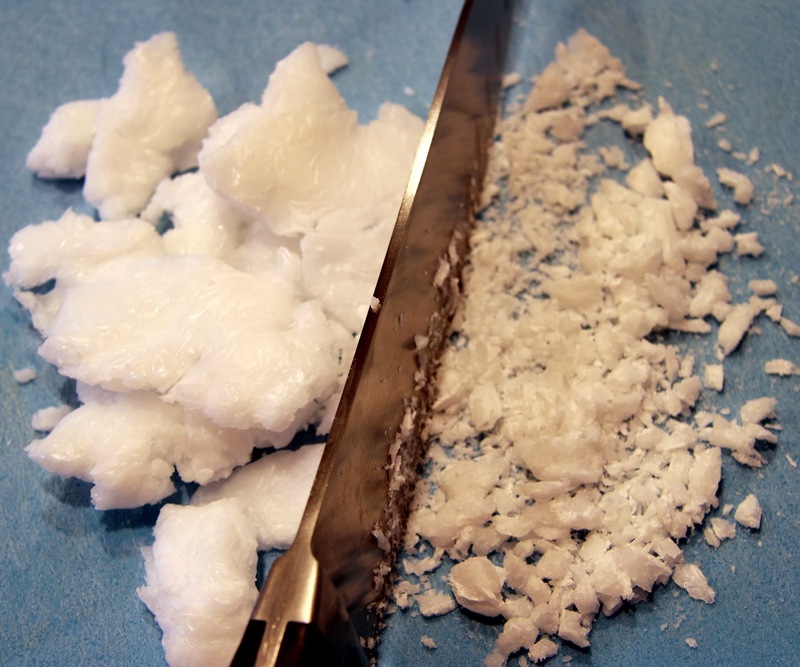 Cut the other 1/2 cup of shortening or coconut oil (shown) in small chunks. 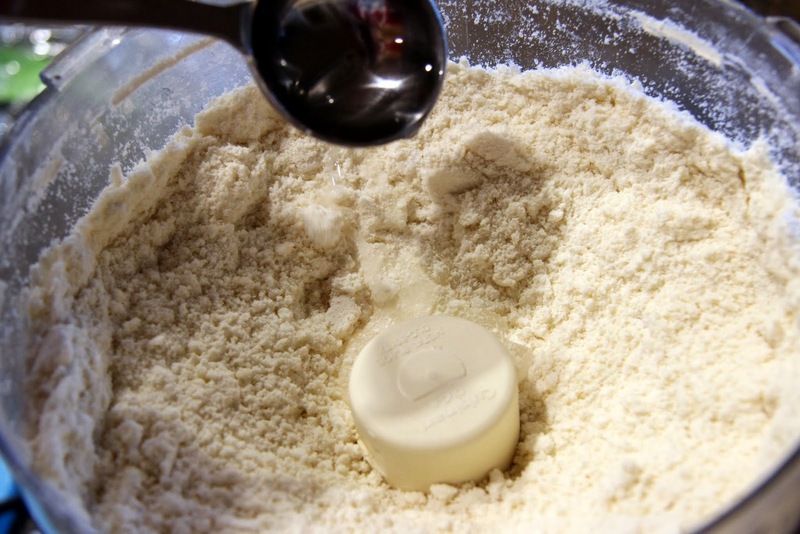 Add remaining 1/2 cup flour and shortening/coconut oil to work bowl. 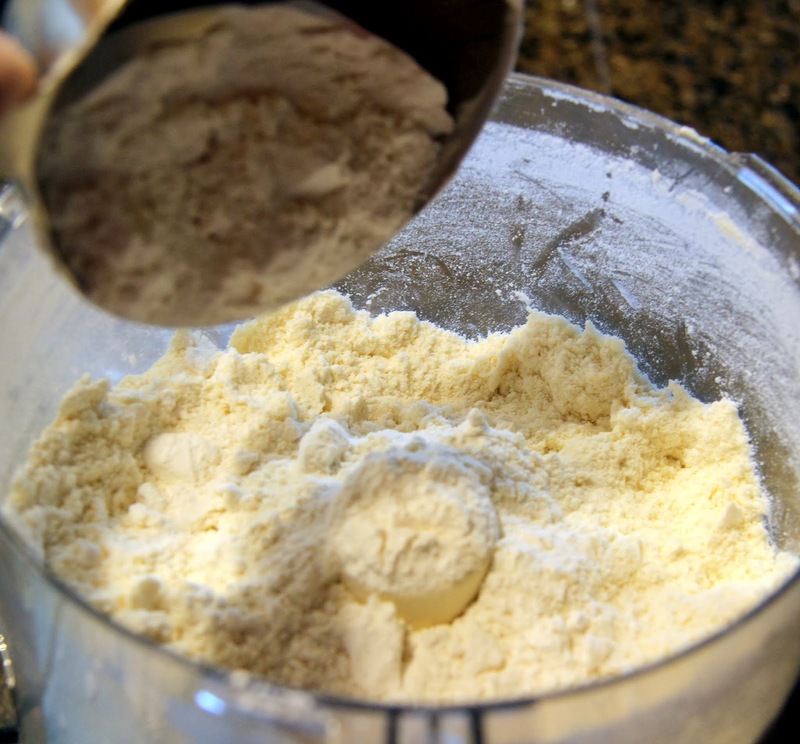 Using the food processor (on pulse), pastry cutter or your fingertips (coolest part of your hands), incorporate into flour mixture until all of the flour has been combined with the butter/other fat. 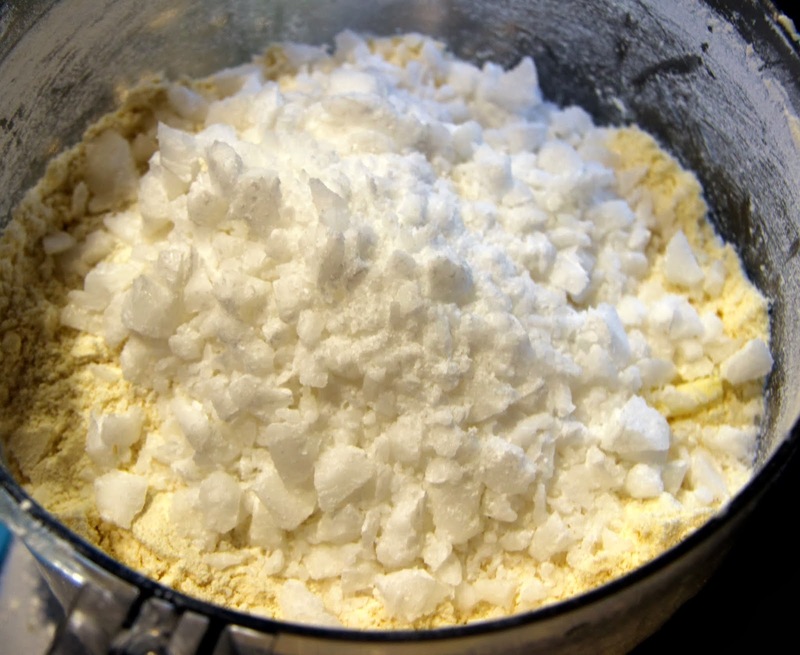 It’s preferred to have some very small chunks of shortening/coconut oil that are not fully combined; this will contribute to a flaky texture. 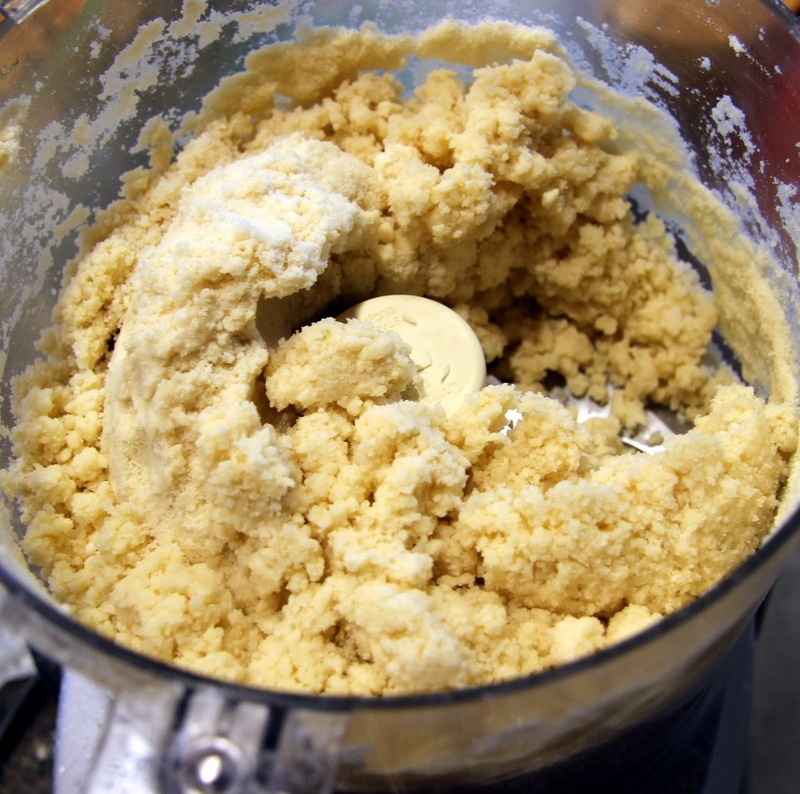 Using the food processor (on pulse), pastry cutter or your fingertips (coolest part of your hands), gradually add vodka/water mixture until just combined. Start with 8 TB of water/vodka and add more as needed. I usually use 10 – 12 TB. 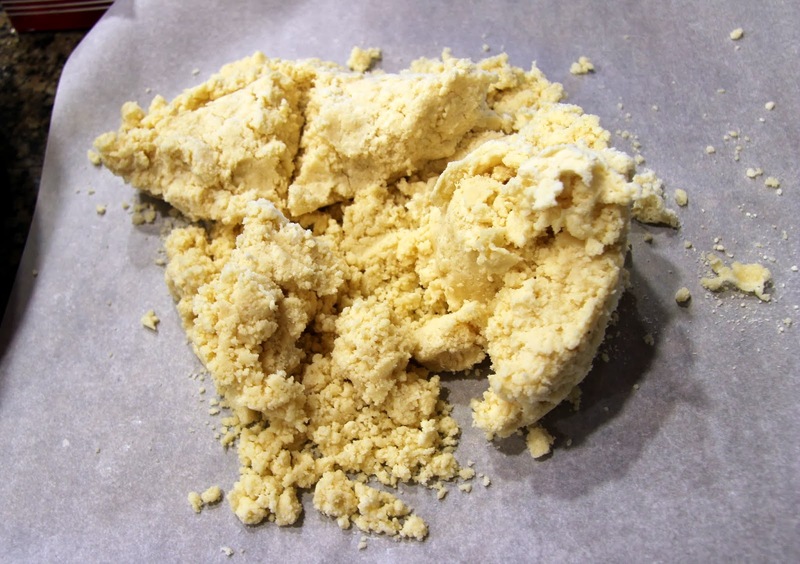 Do not over-mix or you will get a tougher crust. 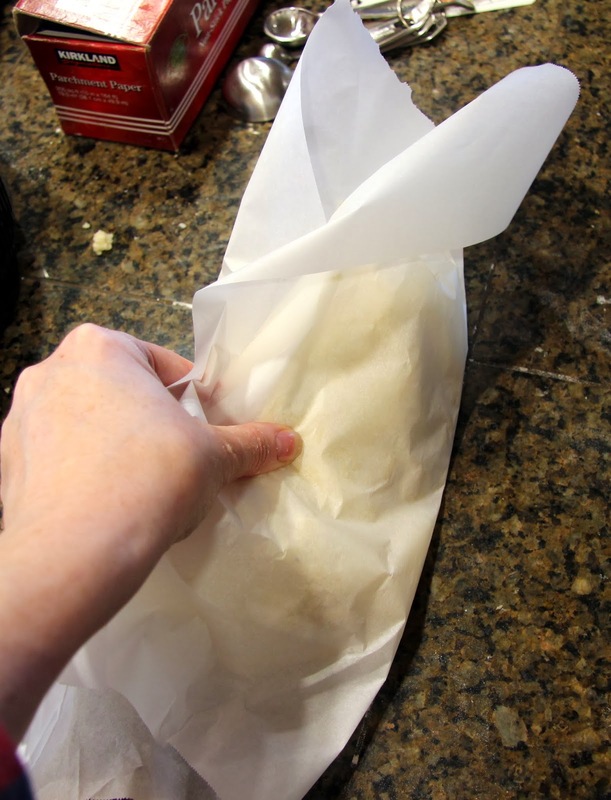 Turn dough on to parchment paper or plastic wrap. 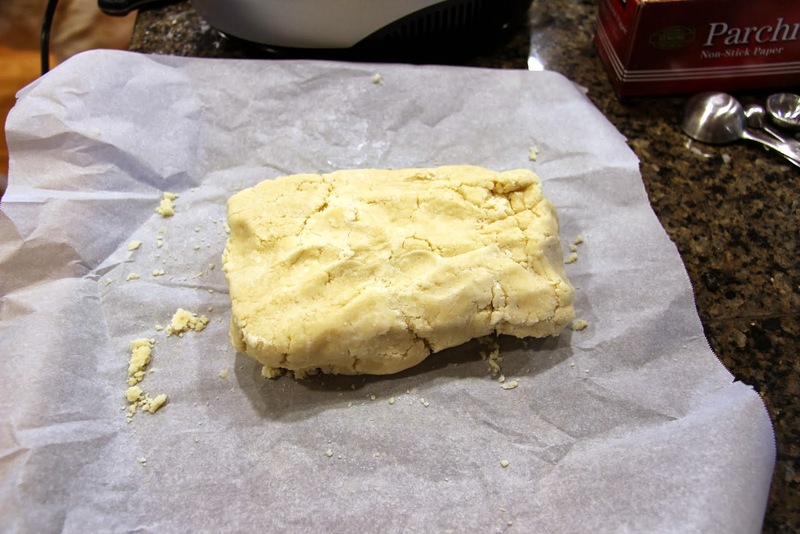 Using the paper or plastic rather than your bare hands (too warm), gather the dough and shape into a sort of log shape. 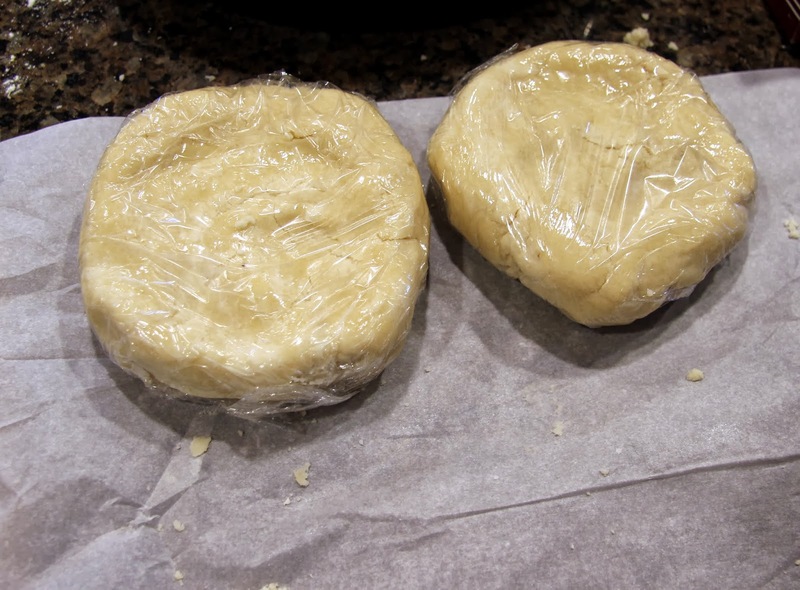 Cut that in half, shape into disks, wrap in plastic and refrigerate for at least one hour (or up to a few days). 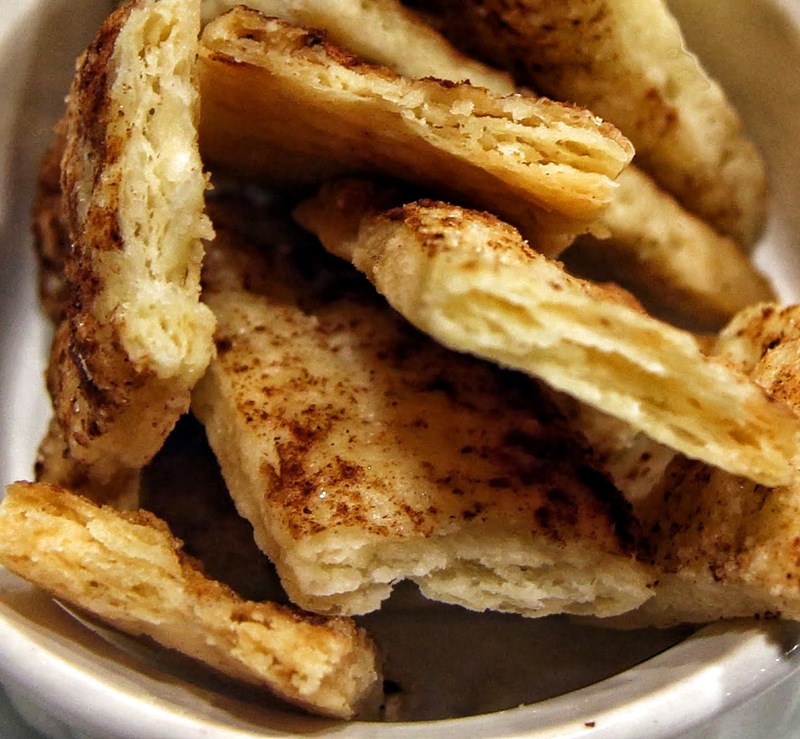 You may also stick them in the freezer at this point if you are making them a week or so ahead of time. 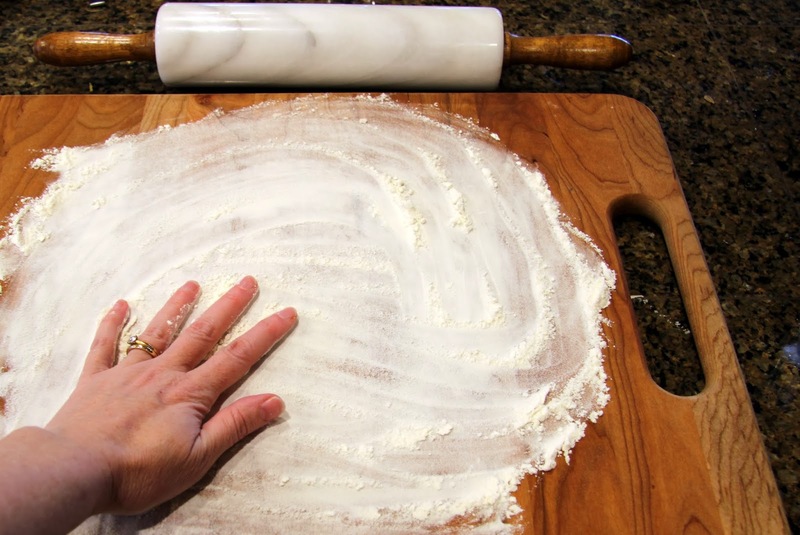 Prepare large cutting board or work surface by spreading out a thin layer of flour. Begin rolling out the cold disk of dough, working from the middle out almost to the edge, flipping and turning as needed. If you are new at this, be kind to yourself because it does take practice. 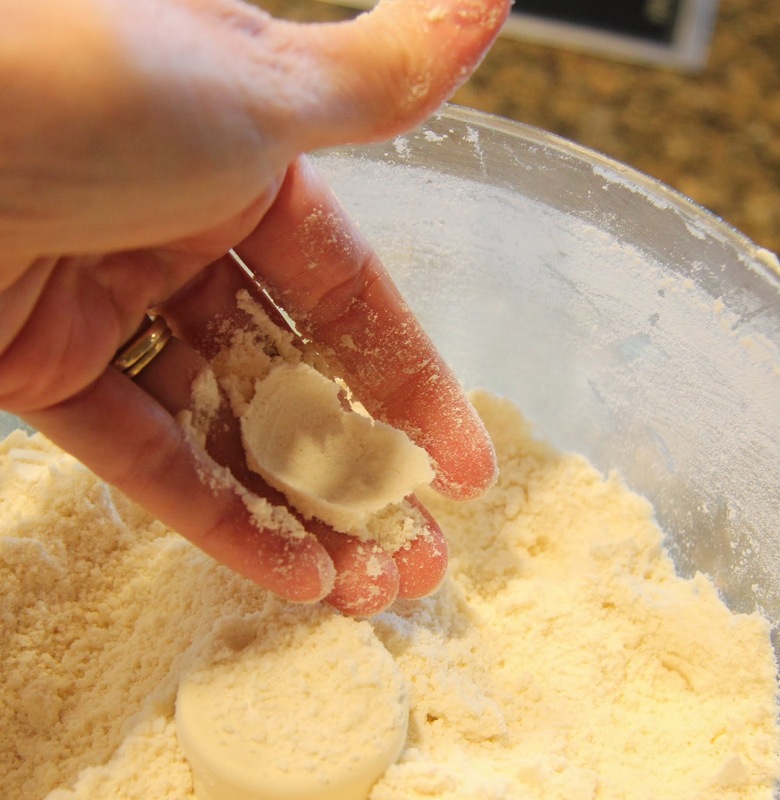 Remember you can piece/press the dough back together if it breaks too much at the edges – just don’t use excess flour when doing it. 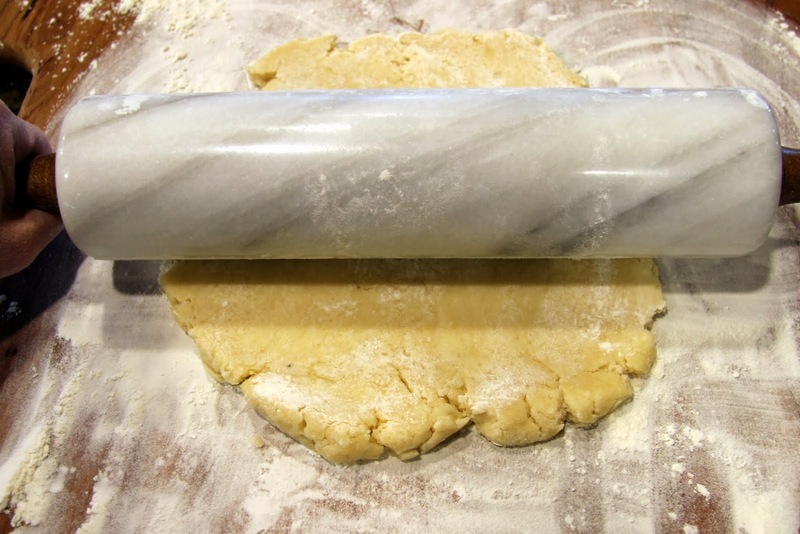 The rolled dough should be a couple inches more all around than your pie plate. 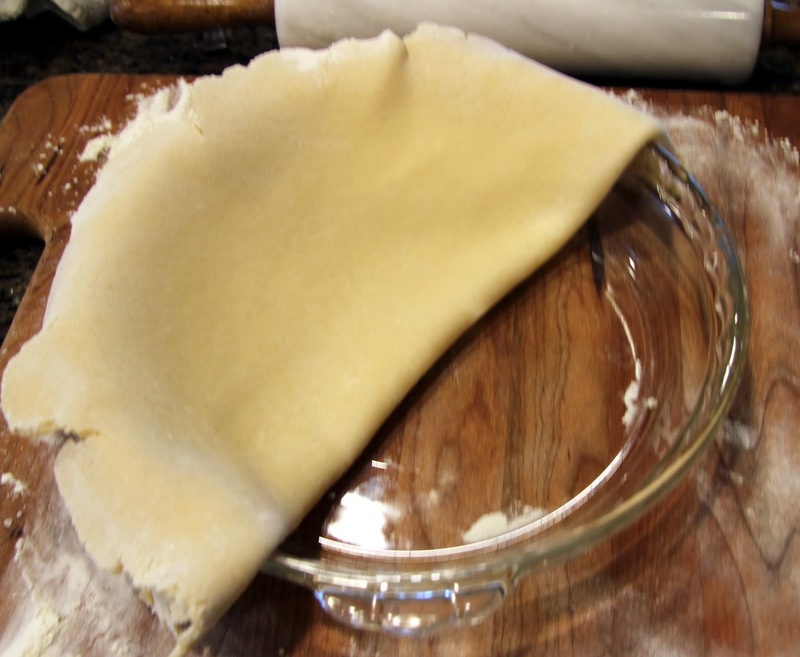 Transfer to the plate by folding it in half, then carefully place it on the pie plate and unfold. 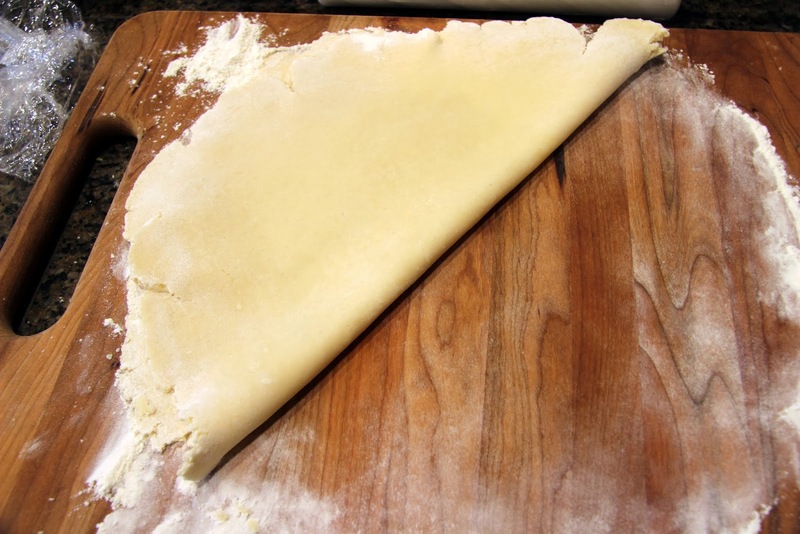 Trim excess dough until you have a 1 1/2 inch – 2 inch overhang. 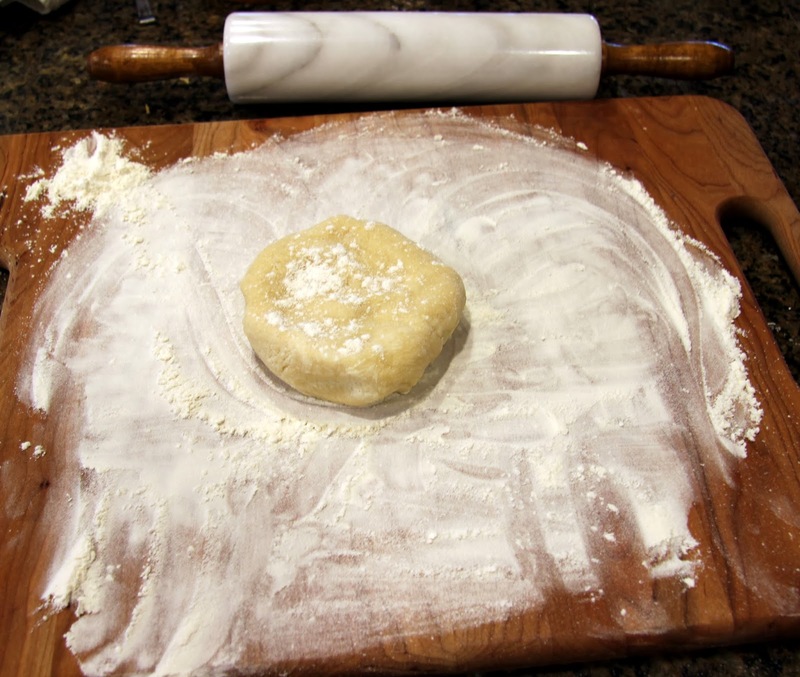 Fold the dough under all the way around, pressing slightly on the edge of the plate. 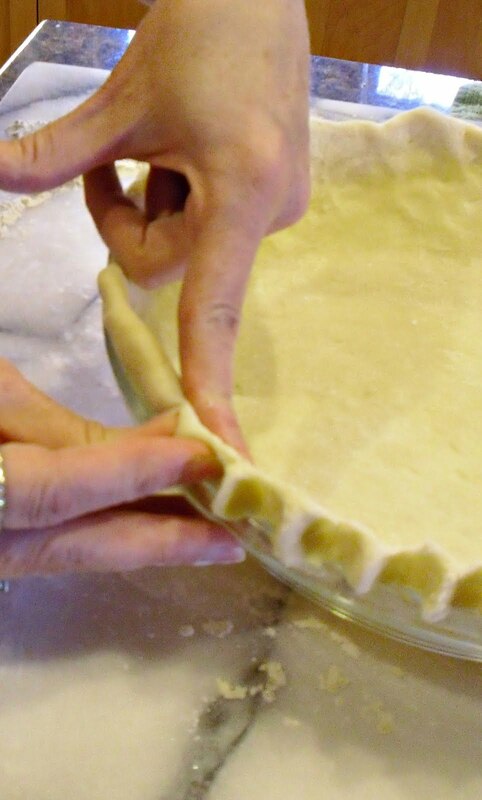 At this point, if you are making a fruit-filled, double crust or lattice top pie, you may proceed according to whatever recipe you’re using. 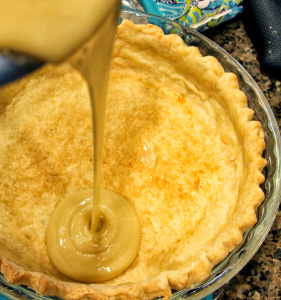 If you are making a pre-baked crust for a cream pie or blind baking (fancy for partially baking) a crust for a custard pie, such as pumpkin, proceed with the following steps. To crimp it nicely, simply pinch it with your thumb and index fingers. This takes some practice too so, again, be kind to yourself if it doesn’t look perfect right away. Chill for 30 minutes in the refrigerator before baking (I will admit to sometimes skipping this step, but only if my dough has remained pretty cold after rolling). 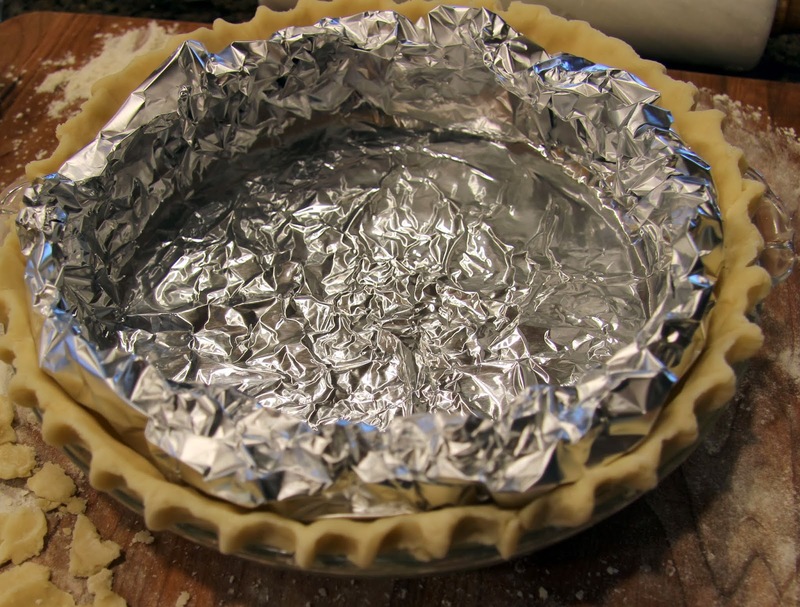 Before baking, take a large sheet of aluminum foil and gently fit it into the crust. 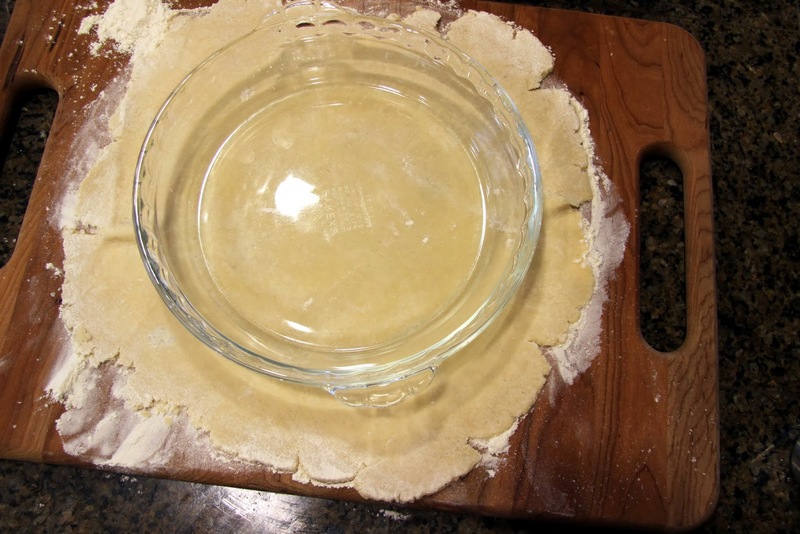 I do this to keep the sides from falling down due to the high-fat content of the dough. 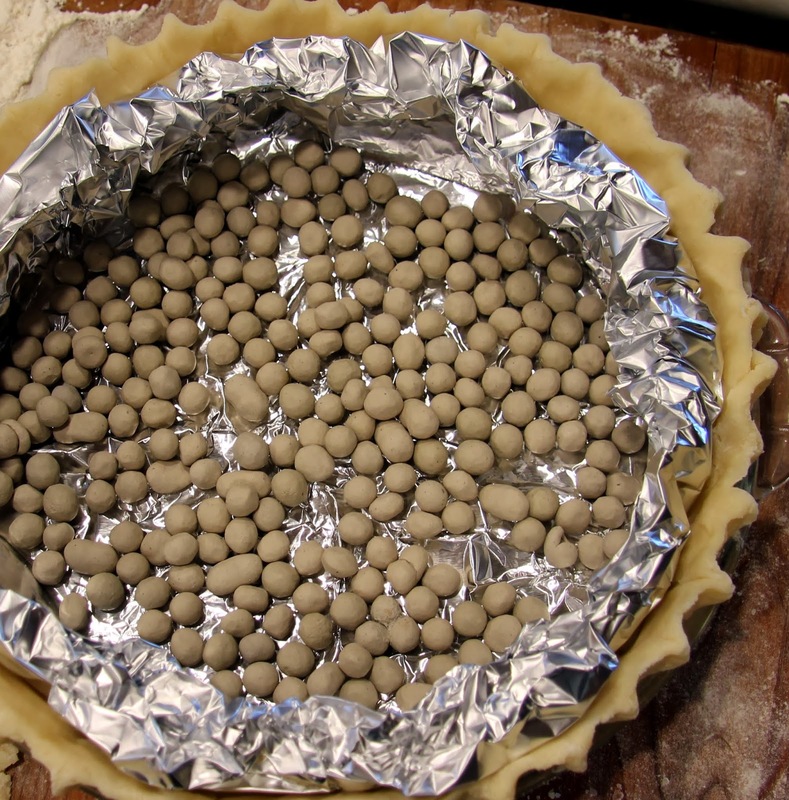 Place pie weights or dried beans in the bottom of the pie plate to keep the dough from puffing up. Bake in preheated 350-degree oven for 25 minutes. 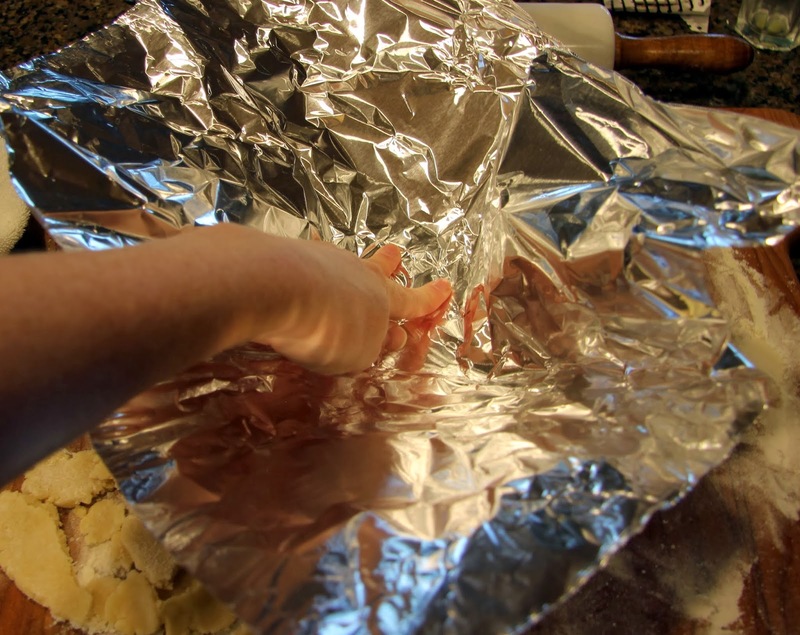 Remove the foil and pie weights. The dough, at this point, should be suitably blind baked to fill for your pumpkin or other custard pie. 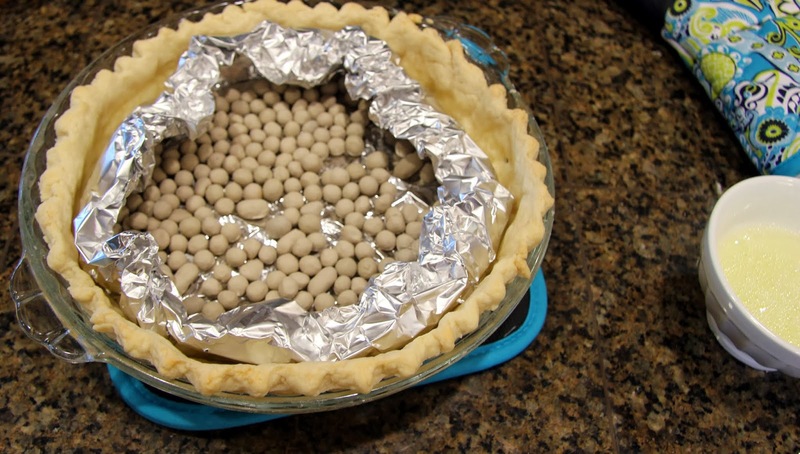 Just be sure when you bake your pie with the filling in it, you cover the crimped top with a ring of foil to protect it from burning. 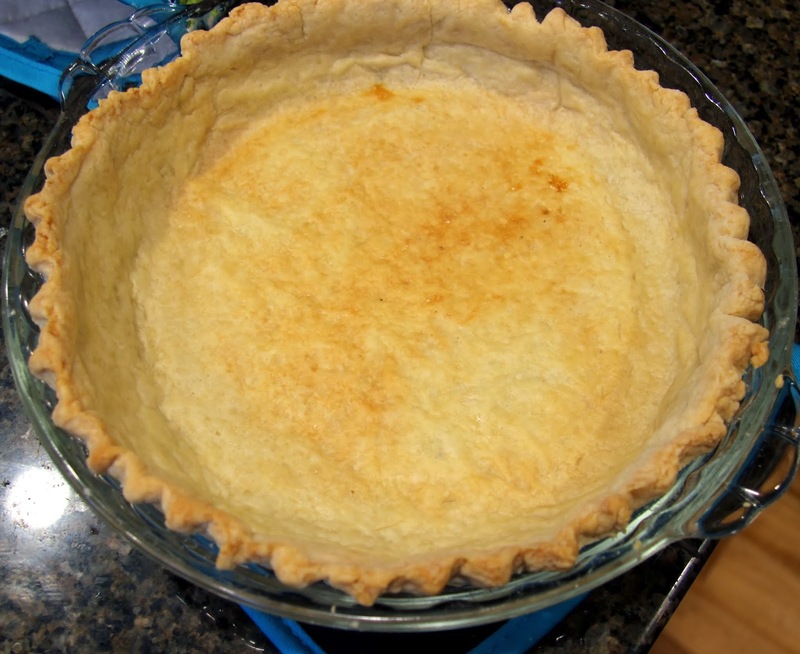 If you are pre-baking the crust for a cream pie that will not be further baked once filled, it will need to bake another 8 -12 minutes in the 350-degree oven. 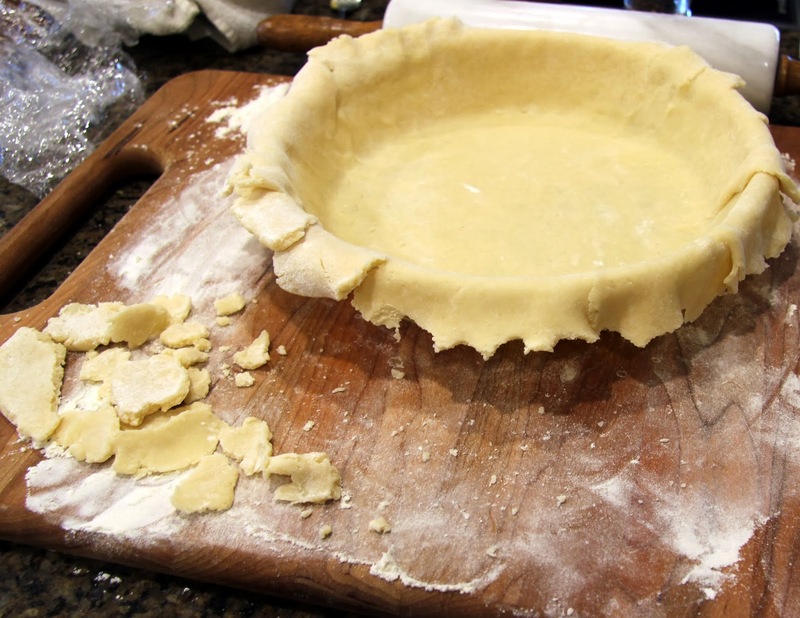 Optional but worth doing… Before the final baking OR before I fill a blind-baked crust, I like to brush a layer of egg wash (one egg, beaten, with 1 TB water) over the entire surface of the hot crust with a pastry brush. 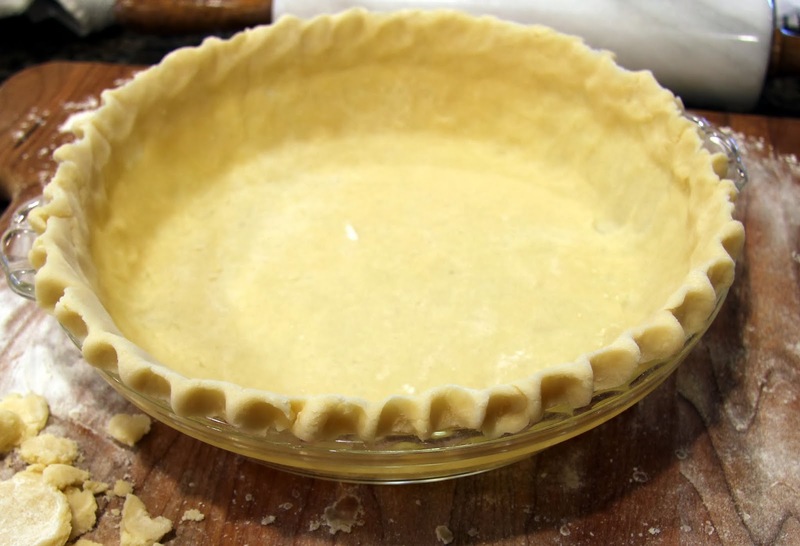 This will aid in an attractive golden color but, most importantly to me, it will create a barrier between the crust and the filling which will prevent the filling from making the crust soggy. 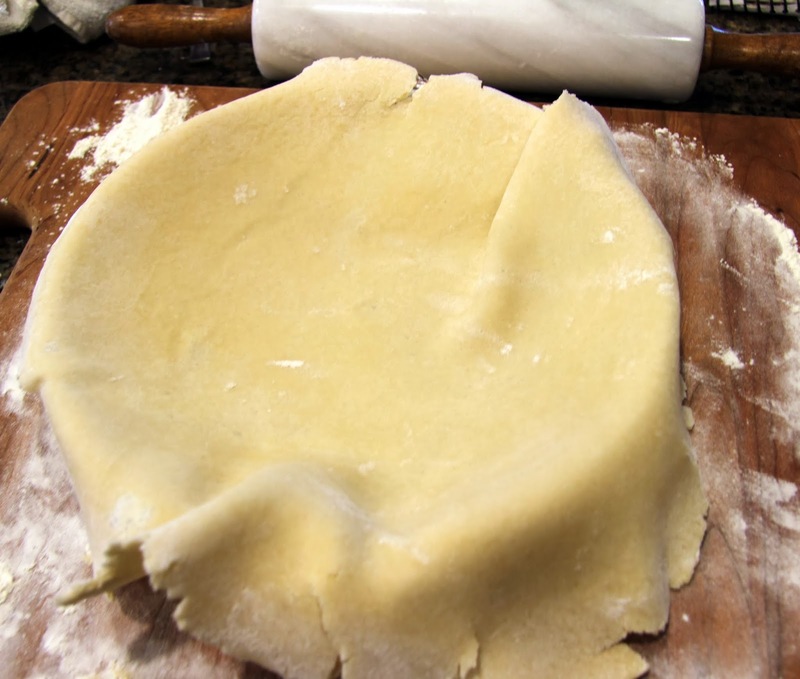 If you haven’t yet noticed, I’m a bit of a perfectionist when it comes to my pie crust. 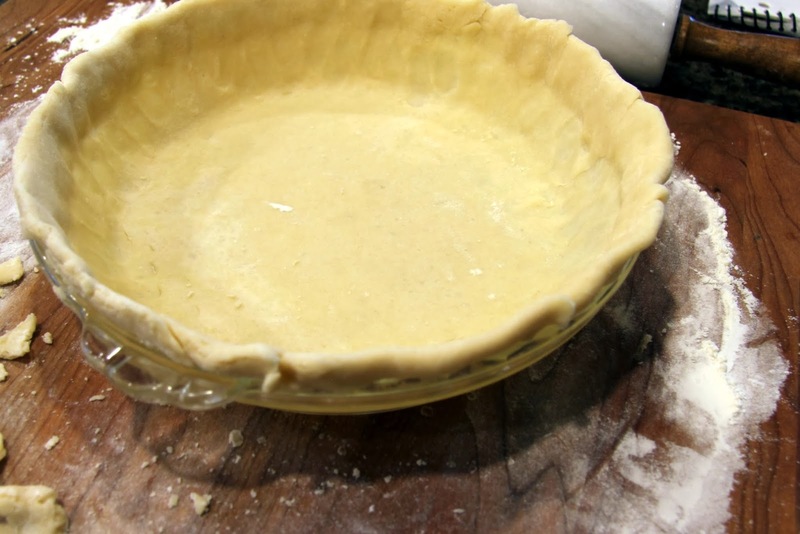 Once the crust has baked another 8 – 12 minutes and is golden brown, remove it from the oven and allow it to cool before filling. 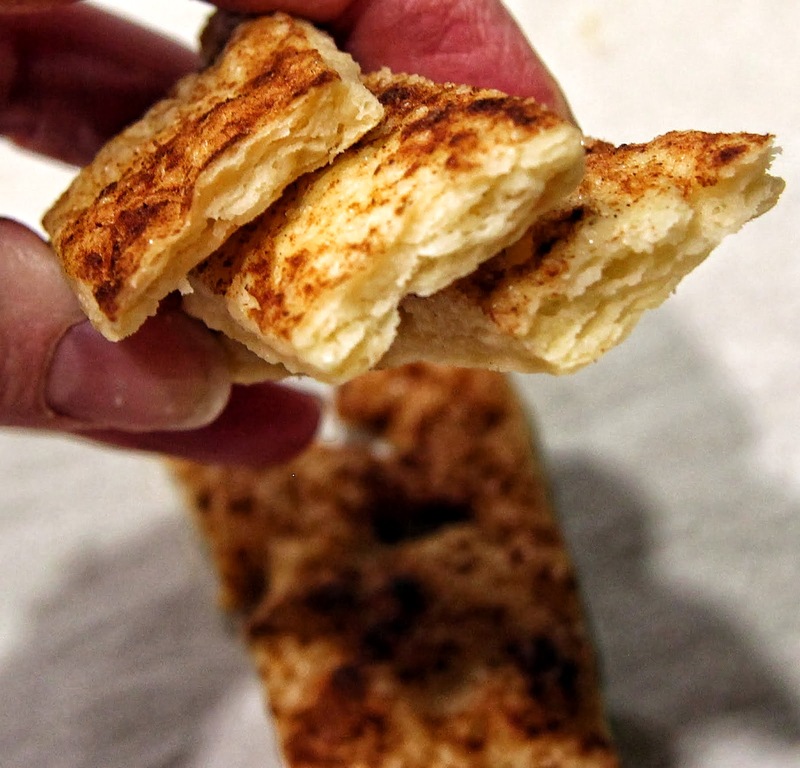 I rolled out leftover pie dough, brushed it with egg wash, sprinkled it with cinnamon and sugar, cut it in strips then baked the crust strips for 20 minutes to demonstrate the awesome flakiness of this crust. My family was very happy I put in the extra effort. I highly recommend you do the same with any extra dough. Delicious!